Verdi’s fourth opera like its predecessors was premiered at Milan’s La Scala – February 1, 1843. It was a big hit, but gradually faded away such that by the end of the century it had all but disappeared. More recently it has reappeared, most recently in New York City last week where it was successfully received in a concert performance. The opera is full of wonderful music which easily overshadows the gaucheries it also contains. The story is disjointed and silly. But this is opera where the story matters only to the extent that it provokes the composer of genius to set it to great music. Verdi clearly believed in it and took its situations very seriously. Unprecedented in Verdi’s operas is a secondary tenor role that is bigger than that of the lead tenor. Also, there’s no baritone part. Like Nabucco, I Lombardi Alla Prima Crociata gives the chorus a lot to do. Besides ‘O Signore dal tetto natio’ which is almost as familiar as ‘Va pensiero, the chorus is busy throughout the four acts. The Parma production uses period specific costumes. Its sets are mainly bare stages with background projections. The staging was quite effective and carried the action along with dispatch. The Teatro Regio seats 1200 and has a stage proportional to the size of its auditorium. These productions show how well Verdi works in a theater less than one third the size of New York’s mammoth Met. 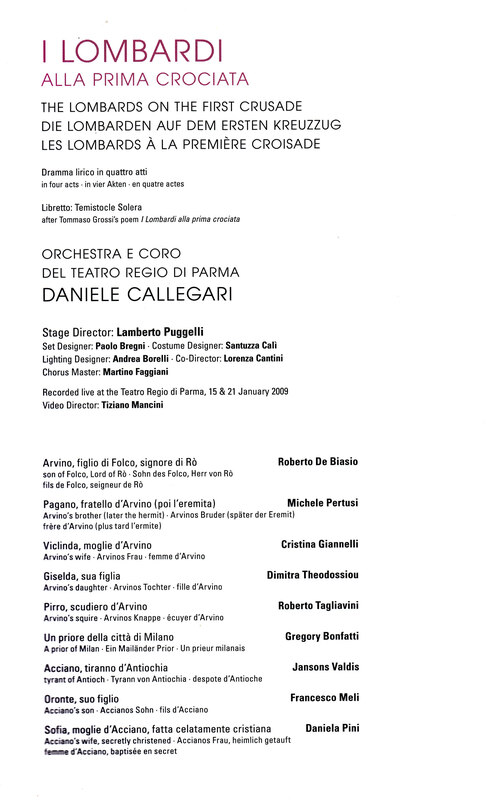 Parma staged I Lombardi in January of 2009. The evidence on the DVD indicates that it was an unqualified success. Much of the credit for the brilliance of this performance belongs to conductor Daniele Callegari. His tempi were also right on the mark. The action never lagged. The chorus was taut. Callegari supported the principals without merely following them. Verdi’s operas all need a master behind the baton if they are to succeed. Callegari was the perfect Verdian. Conductors of Verdi’s operas, especially the early ones, often get bogged down. I’m not sure why it happens so often, but it does. This performance never lagged. His cast was uniformly up to the mark. As in Nabucco, the soprano lead has the most demanding music. Dimitra Theodossiou was again cast in the lead role. This performance was recorded 10 months before Nabucco. There was no problem on this outing with a wobble. Ms Theodossiou as Giselda was sensitive and expressive in her quiet music and knocked the audience out in her moments of explosion. Here’s her reading of the well known Salve Maria from the first act. All is not peace and tranquility in this opera. Listen to the act 2 finale. Giselda is giving her father and fellow Christians hell for being so bloodthirsty. Verdi marks the line quasi colpita da demenza (almost hit by dementia). This is one reason that I love these early Verdi opera so much. The finale also shows why singing these roles on a regular basis is likely to prematurely end a soprano’s career. The young tenor Francesco Meli (born 1980) has sung five performances at the Met – all as the Duke in Rigoletto in 2010. 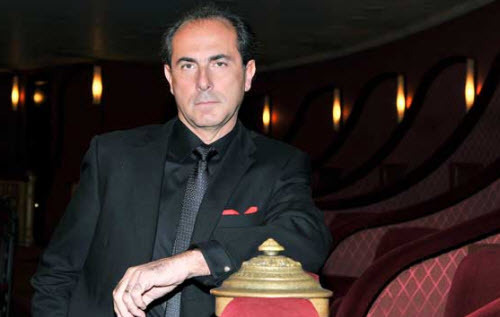 Here is his performance of the double aria beginning La mia letizia infondere. Meli has a focused lyric tenor that fits his part as Giselda’s lover, Oronte, who converts to Christianity to please her and his mother. The remaining principal role is Pagano – Giselda’s evil uncle who finds sanctity in the desert after killing his father by mistake. He meant to kill his brother. In his mind fratricide was not as bad as parricide. Michele Pertusi was Pagano. He has a lyric bass, which the Met has heard more than 60 times and which was more than equal to the role’s undemanding requirements. The famous trio in the third act was beautifully sung, though nothing compares to Caruso et al’s 100 year old recording. Roberto De Biasio was fine in the thankless role of the other tenor – Arvino, Giselda’s father. As I alluded above, the chorus was very good – its part is so prominent that it’s virtually another principal. Parma made as good a case for I Lombardi as possible. When it’s performed as well as it is on this recording Verdi neglected work springs to life. This DVD is highly recommended. Better than the 1976 Sass Carreras version?? That’s my favorite. I haven’t seen that one; so I can’t comment. Its audio live. Sass is ethereal, those high ppp’s to die for, and Carreras the best I’ve ever heard him. At his zenith. Spectacular!